French fries are um, delicious, amazing, craveable … I could go on. I don’t think I’ve met a person who doesn’t like french fries. Even my daughter who doesn’t like potatoes, loves french fries (because they don’t count). 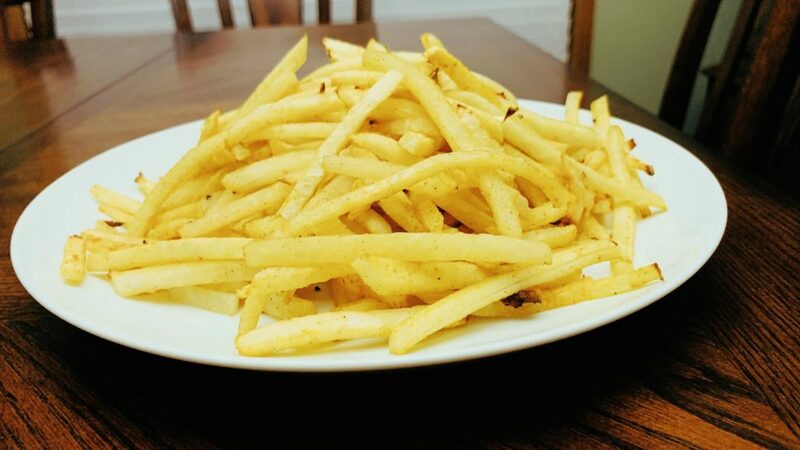 Fries go perfect on the side of so many dishes or just as a snack all by themselves. But I think most of us know, we shouldn’t eat them all the time. And, if you’re eating low carb or Keto, they’re just not an option. Well let me introduce you to jicama, it’s my favorite potato alternative. 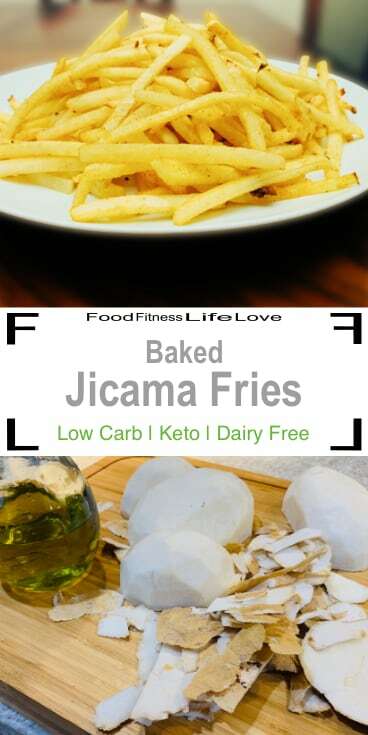 1 cup of jicama has only 5 net carbs compared to the potato which has 25 net carbs in 1 cup. Jicama is high in fiber, low in sugar and a good source of vitamin C. I’ve been adding jicama in with my roasts instead of potatoes. The high fiber makes the jicama crunchy, which you still notice after its been cooking all day in the slow cooker. But, if you pressure cook the jicama in an instant pot with your roast (the whole time) the texture is soft and tender just like potato. The kids couldn’t tell the difference. Today, however, we’re talking about french fries. 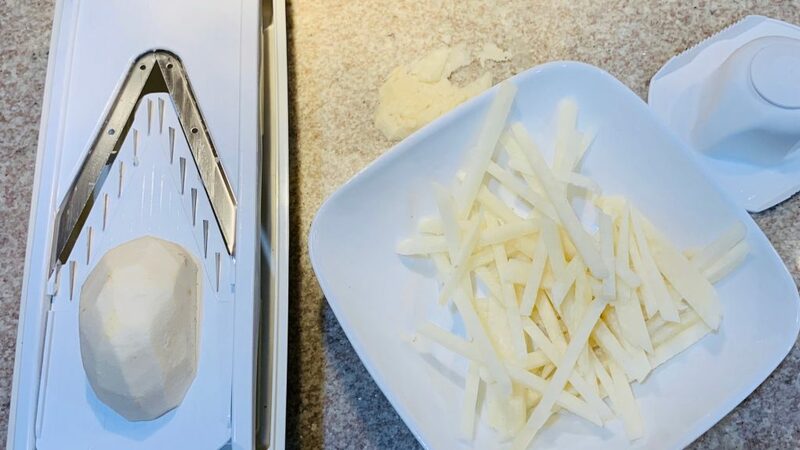 After tasting this Baked Jicama Fries Recipe, you’ll realize low-carb fries are possible. 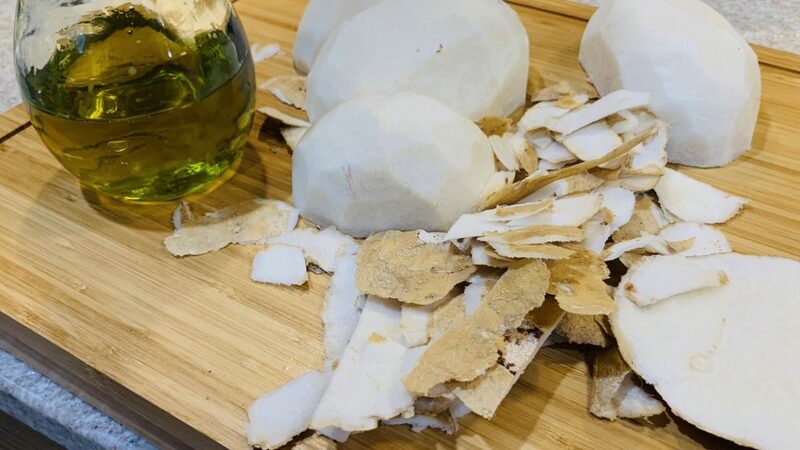 Just like any fries, you have to cut your jicama into sticks. After peeling the jicama, it’s time to get cutting. I used a v-slicer mandolin. This makes cutting fries so much easier and quicker. If you don’t have a mandolin, you can always cut the fries by hand on a cutting board. 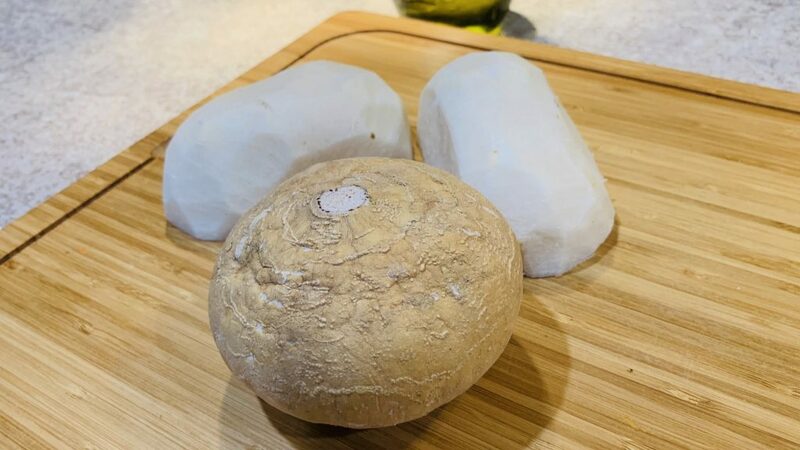 First, cut the jicama in half, so you have a flat surface to put on the cutting board. Then, cut the jicama into 1/4 inch slices, and finally into 1/4 in sticks. 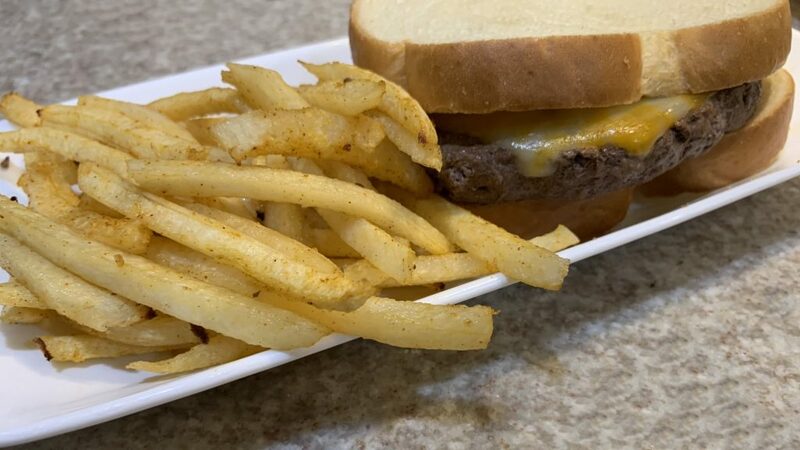 After all the fries are cut, it’s time to season them. I tossed my fries with olive oil and season salt. The best way to mix is to get in there with your hands tossing until each fry is thoroughly coated. Next time I want to try making some garlic fries. Yum!! Once the jicama fries are coated in seasoning, spread them out on baking sheets. I ended up using two because it’s important that they are in a single layer. The jicama fries come out of the oven golden and delicious just like potato fries. The whole family loves them. And the kids couldn’t tell I switched vegetables on them. 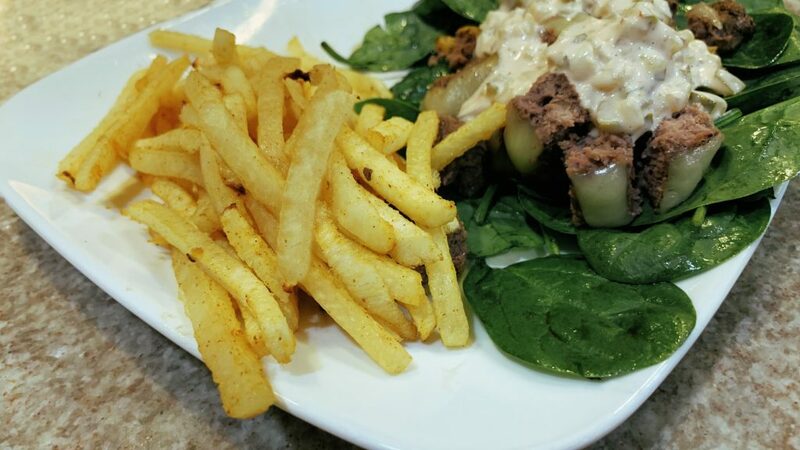 This Baked Jicama Fries Recipe is perfect as a snack, on the side of a burger, or next to a burger salad, which ever you prefer. Peal the jicama. Cut into 1/4 inch fries using a V-slicer mandolin. Alternatively, you can cut them by hand with a knife if you don’t have a mandolin. 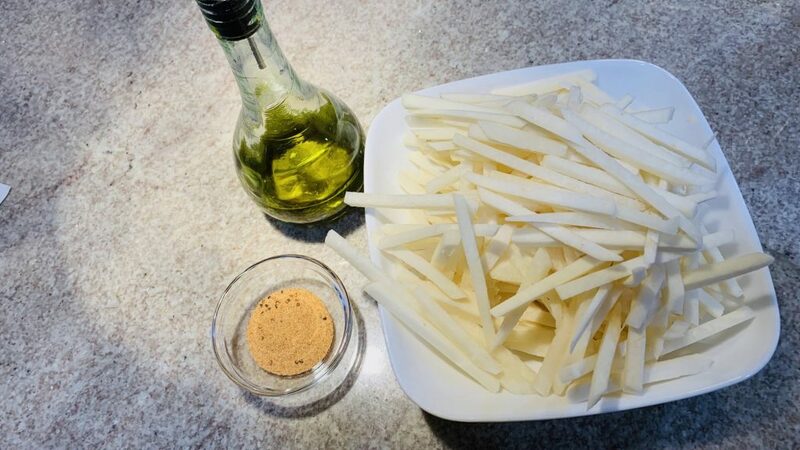 Toss the jicama fries with the olive oil and season salt until each one is evenly coated. 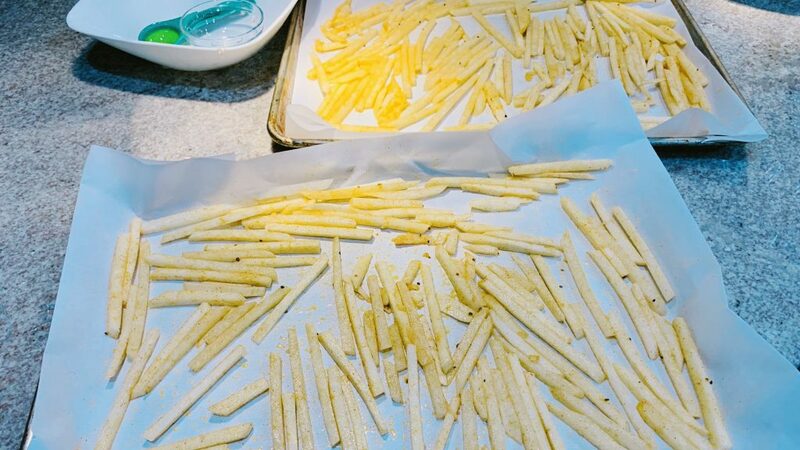 Spread the fries on a parchment lined sheet pan or cookie sheet in one layer. If you need to, use two sheet pans so that the fries are not on top of each other. 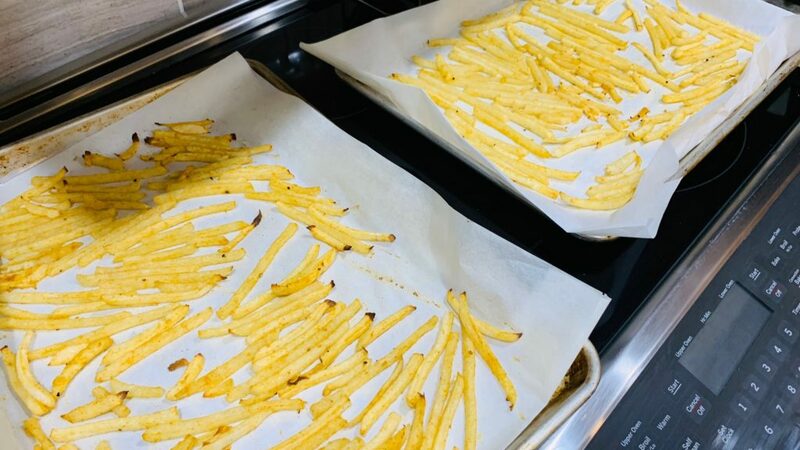 Bake for 30 minutes until the fries are golden. Serve and enjoy.